It starts with that playful old click of the stylus dropping onto the play-in groove of crackly vinyl. But there's little else retro about Diamond Days. This is discreetly articulate, literate acoustic music planted firmly in now, balanced by an intelligent respectful acknowledgement of progenitor roots and past masters - "look 'em up on the net," Eric Bibb advises. He runs a spectrum of blues styles and techniques - from the kind of gospel-infusion on Shine On that even a militant atheist like me can enjoy, then takes in Dylan (Bucket Of Rain, the album's only no-original song) allied to Martin Simpson's educated guitar, through the jazzy intimate interplay of the live In My Father's House, into the deceptively-simple chords of Destiny Blues which universalises the existential itch at the heart of consumer opulence. While so much current music is hopelessly impassed in repetition and replication, Eric Bibb takes the oldest form of 20th century music and extricates it all diamond-sharp by exposing the autobiographical truth of clear-sighted poetic observation. On an album replete with the Easter-eggs of hidden tracks and video-clip additions, nothing is contrived. Nothing is pretence. It flows, as it should, as natural as water, out of today. No striving for exaggerated effect. Even with the Orbit-ing electro-echo and ghost-horn on Forgiveness Is Cold, his subtle understated voice and sparse instrumentation tell it all as it should be told. He's living the blues life from playing a biker bar outside Topeka, to a 'blues cruise' to Dominica, from a five-star hotel to sleeping on a stranger's floor. Follow him in the video, tall and elegant in flat-brim hat, as he travelogues you into 'Luthers', his favourite guitar shop down a Paris arcade, where he lovingly selects and unhooks guitars from the wall, to finger-pick Candy Man on a Gibson from the 'Robert Johnson time-zone', price-tag still dangling from its neck. He reminisces about Mickey Baker, and how Dave Van Ronk taught him Talk It Over One More Time. Back on the CD, Dr Shine is a timeless shoeshine sales-pitch that could date from the Great Depression years, but polishes up new like a story that's stepped direct off the Columbus Ohio airport. The closing track, Still Livin' On encapsulates it all, affectionately and knowingly nodding to the heroes who still strengthen Bibb's own repertoire in thumbnail sketches of those who inspired, and inspire in a persistent continuity seldom expressed better than it is here. Mississippi John Hurt, Son House, Roebuck 'Pops' Staples, their "voice inside my own." The 'hidden track' is the old skiffle favourite Worried Man Blues renewed by his irreverent interjection "if anybody asks you who composed this song/ tell 'em it was me, and I sat all day long..." and, for a moment, you almost believe him. But that's what blues does best. Re-writes and renews itself. As this excellent CD does better than just about anything else you're likely to hear this year. 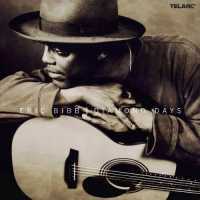 If there's a balance to achieve, Eric Bibb has it dead to rights. Until the crackle fades, and the stylus lifts.